Julian Beavers has done it again with his spectacular 3D Street Drawing. 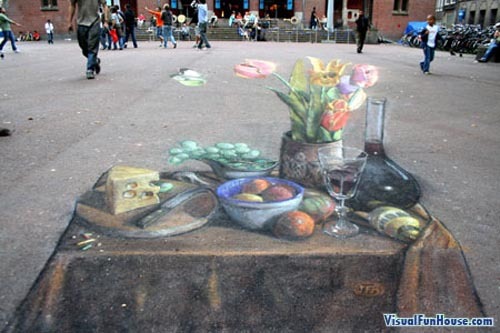 The three below are some of the latest to his ongoing collections of 3D Chalk Drawings, Julian is by far one of the best I have seen in respect to chalk drawings. 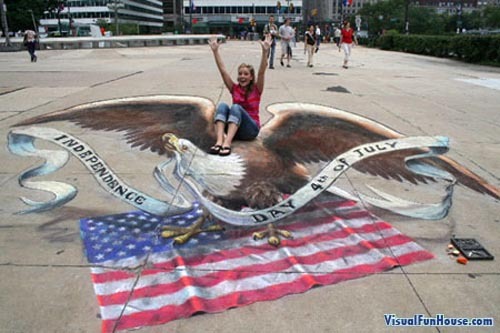 The first 3d chalk drawing is of an American eagle for independence day on July 4th. The second is of a lovely little table set with fruit. The third is of a mid evil prison pit, the poor soles are trying to escape! Also be sure to check out some of Julian Beavers other work. I think Mr. Julian Beavers is an amzing artist and all of his work is sensational. I’m so gald to be able to view is on the web. A New Orleans born Artist transplanted to Oklahoma City after Hurricane Betsy, which hit New Orleans Sept. 9, 1965. I left and became an Okie. My family was forced to leave after Katrina. They are all safe now, of course, in other places. I especially enjoyed the Jazz scene you did in New Orleans with the likeness of Louis Armstrom. Iam abit of an artist myself but your pictures are too amazing nt to share with my freinds. Those are seen quite frequently on the web..
i would like however to know if someone has a link to a geometrical explenation of how to calculate the skew angle ..
Its amazing what you can do with art. 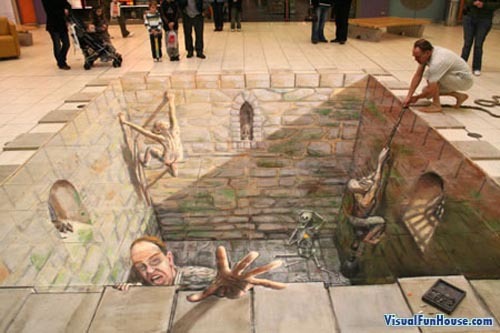 OMG I just recently saw these chalk drawings and I’m so amazed!!! they are so fricken cool. I’m inspired!!! I just Love your pictures next time your in the Bay Area of California near San Francisco, Can you send me a message of where you will be drawing I would Love to see you at work. My husband & I Love to see your work in person. If I had a job I would hire you to do something for me or my Husband , but due to an injury I am not able too at this time. Keep up the Great work I think they are just amazing my email is above.